Erleben Sie das Beste Italiens auf einer umfassenden 10-tägigen Tour von Rom in die Toskana, nach Venedig und Sorrent. Während dieser elf Tage in Italien werden Sie einige der größten Hits des Landes besuchen, darunter Siena, Florenz, Bologna, Neapel, Capri und Pompeji, die zum UNESCO-Weltkulturerbe gehören. Vergleichen Sie die historischen Stätten und reichen Kulturen dieser verschiedenen Gegenden Italiens und bewundern Sie die wichtigsten Sehenswürdigkeiten wie den Florenzer Dom, die St. Markus-Basilika und die Vatikanischen Museen. Die Unterbringung in 3- oder 4-Sterne-Hotels ist inbegriffen. Ihre 10-tägige Italienreise beginnt in Rom, wo Sie Freizeit haben, um die berühmten Sehenswürdigkeiten wie das Kolosseum zu erkunden. Anschliessend fahren Sie die Stadt mit dem Bus für 11 aufregende Tage durch die Toskana, Venedig, Kampanien und Sorrent. Genießen Sie während Ihrer Tour die verschiedenen Arten der italienischen Kultur, die von Norden nach Süden variieren. Genießen Sie die atemberaubende italienische Küste, bewundern Sie die mittelalterliche Architektur der Bergdörfer, machen Sie eine Bootsfahrt zur Insel Capri und lassen Sie sich von den Vulkanruinen von Pompeji, einem Weltkulturerbe, beeindrucken. Standard- (3- oder 4-Sterne-Hotels mit Grundausstattung) oder Superior-Hotels (luxuriöse 4-Sterne-Hotels) sind für eine Nacht in Rom, zwei Nächte in Florenz, zwei Nächte in Venedig, zwei weitere Nächte in Rom, zwei Nächte enthalten in Sorrento und eine letzte Nacht in Rom (treffen Sie Ihre Hotelauswahl bei der Buchung). Einige Mahlzeiten sind im Preis enthalten, und für den Rest bietet Ihnen Ihr Guide ausreichend Freizeit, um die lokalen Restaurants auf eigene Faust zu besuchen und die regionale Küche zu genießen. Bitte beachten Sie: Die Preise enthalten keine Tourismusabgaben, die Sie direkt bei der Ankunft oder beim Check-out an die Hotels zahlen müssen. Die Stadtsteuern ändern sich je nach Hotelkategorie. Die Hotels unterliegen der Verfügbarkeit zum Zeitpunkt der Buchung. In dem seltenen Fall, dass das erwähnte Hotel nicht verfügbar ist, werden Sie in einem anderen zentral gelegenen Hotel mit der gleichen Sternebewertung untergebracht. In der Nebensaison (November 2016 bis März 2017) findet kein Besuch auf der Insel Capri statt. Sie können also einen ganzen Tag in Sorrento alleine verbringen. - I appreciated the hotels that offered breakfast! - Loved the location of the Hotel Defino in Venice easy off/on when we came back on the bus, there was a store next door to get all types of odds/ends, snacks, wine , etc , and there was a bar a block down that served wine for 2.50 euros! 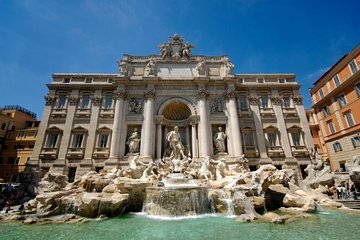 - The underground metro in Rome is very easy to get around on worked out great to use it to see the sites in Rome that the tour did not cover. - I took all the optional tours definitely worth it!!! And don't be worried about waiting and booking the optional tours when you get there they only book these once you are there my friend was worried they would not have room but Sabrina books the optional tours after she collects the names of who wants to go. - Sabrina would share information a couple days at a time this was a good strategy because the amount of information coming at you and the fast pace can be overwhelming. She ALWAYS made sure everything worked out perfectly for everyone so have no fear of that you'll miss out on something just because she has not talked about it yet. In a nutshell, this was a mess compared to the northern part of the trip. We got a new tour rep and changed buses several times. It would have been better if they explained beforehand that they do a day trip to Pompeii so the day trippers and overnighters like myself take a bus from Rome to Pompeii. Overnighters moved their luggage to a different bus which then took us to our hotels. Then we had a couple of bus changes coming back we went back to Pompeii and a couple days later and drove back with the Pompeii day trippers. I must share...Pompeii was amazing! As for the rest of the trip...they put a few of us in a different hotel as was originally planned which 1 would not hold our luggage in a secured area on Day 10 so we missed taking a tour of the Amalfi coast : and 2 the hotel was not anywhere near as nice as the other hotels others on our tour got to stay in. I was prepared from reading other reviews that the southern part of the trip was very unorganized and they were correct. But, after complaining and showing proof of the huge mess on Day 10 the Italy tour company responsible did work hard to resolve my complaints which I appreciated. Capri. The water was too rough to see the Grotto and it was raining, but Sasha our local guide did an amazing job making it a great day. And the food at the restaurant arranged for lunch was really good! I WOULD recommend this tour. We saw and did SO MUCH! It truly was a taste of Italy. The tour was good. The northern leg going to Venice has a trip director and was very seamless. The southern portion to Sorrento was slightly disorganised. We arrived at the we love rome offices by transfer organised by tour. There was a large group of tourists and various we love love information people. All of them had different information on the bus to Sorrento. We had to queu on three different queus because the guides would look at our voucher and direct us to a bus but the driver would verify the voucher and say this was the wrong bus. It was pretty frustrating. Generally the food has to be improved in various areas i.e. Florence lunch. Florence hotel dinner was horrendous, Nepal lunch was dried out like it had been waiting for the whole day yet we were not late this rendered it tasteless. Food in Sorrento was a dream. We stayed at the ....Villa hotel. Food in Anicapri was terrible also. The Director for the northern portion of the tour was outstanding. The first part of the excusion with Nicole was excellent ,well organized,she was on top of everything and very kind and informative to all. I felt the second part of excusion we were more on our own and too much switching of buses and guides. I think there should be 1 group with same hotels,you waste too much tome pick up different groups from every hotel. the Tour to Pompeii was a waste of a day as it took all day to get there as they didnt put people staying overnight on the same bus. We had the best holiday ever. We took the tour in April 2017. All itineraries were well planned and organised. The sceneries and places we visited were all stunning. Our guide, Mirjam, and the driver, Carmelo were excellent. They were very helpful and took care of us very well like their own family. The accomodation and meals were of very good quality, with the exception of the hotel in Florence. It is worth to upgrade to the superior class option, and for that upgrade we got a very nice hotel in Venice. Mirjam took us to very nice restaurants for the meals not included in the tour. The whole experience was wonderful. We were with a nice group of people from all over the world. well scheduled, good local tour guide, fun and interesting! The part of Rome to Florence was OK and the tour guride Miss Patrizia did a fair job. She was not sure of the schuedule because she was assigned at the last minute by the tour operator. She tried to be nice and helpful as much as she could. Sabattini was the driver and my complements to him for the good job. In Venice we had an older lady that was a local guide with much knowledge and culture. But we had to find out way back to the hotel on our own and that was a more than an hour and half walk experience without a guide. Sorrento was the most caotic expecience with a tour guide was stinky smelling, no knowledge at all, the oposite of on the Pompei ruins that took us for almost 3 hours tours with lots of knowledge and making the experience a beautiful learning one. The lady that took us after Pompei to our hotels, Ornella, was young and very talkative in several languages. Her personal presentation was all sweaty, torned jeans and in dirtly sneakers, totally unprofessional. The tour guide fromSorento to the island of Capri was the worst of the entire tour, changed things at the last minute, did not explain anything about the place, just took us to a very poor restaurant and ordered the most cheapest food and left us on our own until we all complaint to go to the blue grott, so he was forced to take us all there to at least see it from the outside since the water levels were high and we could not get in. His name was Hector. The entire entire experience was with last minutes changes, no proper tour guides, left abandoned in the pouring rain in the Vatican tour for 20 minutes enough time to get us all soaking wet and latter with a cold and sore throught. I am aware that September is the month of high season for Italy, but the tour operator could have been more organized with the customer service! Our group saw all the main sites in Rome, Florence, and Venice. Also we visited many other areas including Sienna, Assisi, Naples, Pompeii, and Sorrento. We had an excellent group of visitors from around the world, and Carlos, our tour guide, was a great source of information on the areas we visited. A very enjoyable and worthwhile tour! I absolutely loved everything. Our first tour guide, from Rome to Venice and back, was just wonderful. The hotels were great, the food was great, the bus was great, everything!